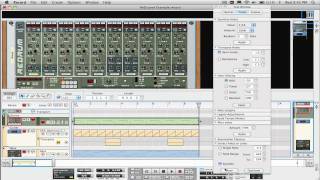 It's all about timing for Reason's groove management console. Meet ReGroove mixer, the unquantizer. Want your music to sound less rigid, less programmed? Need your drums to move and groove as if played live by actual musicians? If you want your tracks to flow with that loose, yet tight feel, a regular shuffle control just doesn't cut it. That's why we created the ReGroove mixer, Reason's own realtime groove management device. The ReGroove mixer gives you more than just a set of sequencer swing parameters - this is a unique device dedicated to one thing: the groove. The ReGroove Mixer applies its timing magic non-destructively and in realtime, giving you freedom to adjust its settings - and fine-tune your groove - as your music is playing. You can lock all your tracks together into one unified feel. Or you can apply different settings to up to 32 musical elements in your song, for ultimate control. Each of the groove channels feature controls for groove amount, slide and shuffle plus more detailed settings. The Reason soundbank comes with a great selection of groove patches, many of them created from analyzed recordings of real musicians as well as classic groovy tracks.